West Linn-Wilsonville School District's graduation rate rose 1.5 percentage points from the 2016-17 school year to 94.5 percent for the 2017-18 school year, according to data released by the state of Oregon Jan. 24. WL-WV's rate of graduation is the highest among the 25 districts classified by the state as "large-sized." The state projects the number of graduates based on how many students enter high school as freshmen. That number is compared with how many of those freshmen graduate four years later to find the graduation rate. West Linn High School's overall graduation rate rose 1 percentage point to 98.2 percent, the highest among class 6A high schools throughout Oregon. WLHS had the top graduation rate among 6A schools last year as well. 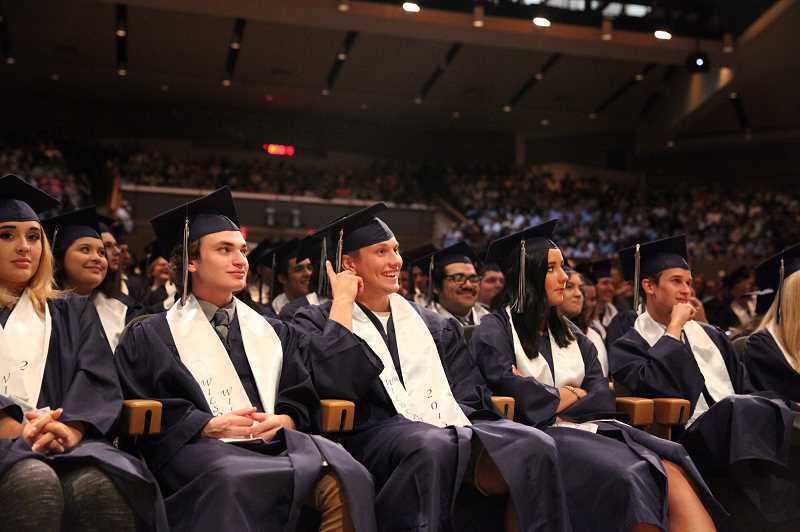 The graduation rate for Wilsonville High School dropped from 96.3 percent in 2016-17 to 94.6 percent in 2017-18, though WHS is still above the state average by more than 15 percent. The average rate for Oregon was 78.7 percent, 2 percent higher than last year's state rate. The rate of graduation for Arts and Technology High School was 55.6 percent. Art Tech's lower numbers can be attributed to the fact that many of their students initially came from WLHS or WHS and that overall, there are so many fewer students. "(Art Tech's) graduation rate is actually part of the overall school district graduation rate," WL-WV Assistant Superintendent of Teaching and Learning Barb Soisson said. "Because there are fewer students, each individual largely influences the overall graduation rate." WLHS's graduation rate for students with disabilities surpassed the state's average by more than 30 percent. WLHS had a 93.2 percent graduation rate for student with disabilities in 2017-18. This rate has consistently been around 90 percent for the last five years. District-wide graduation rate for students with disabilities rose for the fifth year in a row to 81.5 percent. 100 percent in 2017-18, far ahead of the state, which graduated 55.8 percent of these students. "West Linn-Wilsonville remains committed to eliminating opportunity and achievement gaps for all students," a district press release on the report stated. "The district will continue to prepare all students for graduation, career, and post-K12 education." place across all three high schools."